We may have seen it all before in science-fiction films. But the bionic warrior is in fact a vision of real-life warfare in the 21st century. 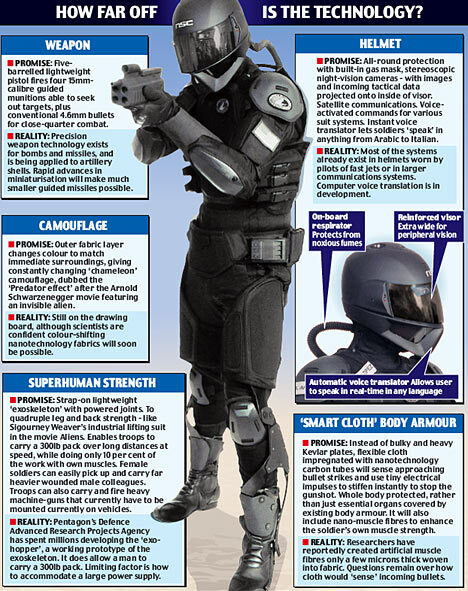 U.S. defence chiefs hope to have their troops kitted out in the outlandish combat gear as soon as 2020. Included in the Pentagon's Future Warrior Concept are a powerful exoskeleton, a self-camouflaging outer layer that adapts to changing environments and a helmet which translates a soldier's voice into any foreign language. These future soldiers will also benefit from 'intelligent' body armour, which will remain light and flexible until it senses the bullet on approach, then tenses to become bulletproof. Apparently, many of these systems are already working as prototypes, or are refinements of existing technologies. Some of the improvements won't be possible until nano-technology evolves a bit more. One has to realise that what they are talking about here is just the very tip of the iceberg. For instance, the exoskeleton in the armor will be able to enhance speed and agility so that soldiers in the future will seem as if they are not bound by the same gravity we are, as the exoskeleton compliments human physiology. They will be able to perform superhuman feats. This kind of suit will be perfect for the Marine of the future. Once again what Science Fiction Writers have dreamed up comes to pass.